Blues and St George batsman Kurtis Patterson. New South Wales Blues and St George batsman Kurtis Patterson and opener Luke Bartier have set a new record for the highest partnership in the First Grade Limited-Overs Cup during round three of the competition on Saturday. Patterson (167 not out) and Bartier (133) amassed 309 for the second wicket during an emphatic 155-run win for St George over Western Suburbs at Hurstville Oval. Their partnership was scored from just 267 deliveries. The stand surpassed the 264 made by former Blues allrounder Grant Lambert and Dean Attard for Fairfield-Liverpool against Mosman in 2011/12. The unbeaten century by Patterson was the 10th of his career in First Grade and first this season for the Saints. His 147 balls at the crease included 17 fours and four sixes. It is ideal preparation for Patterson, who travels to Hobart this week with the Cricket Australia XI, for the three-day day-night tour match against Sri Lanka at Blundstone Arena starting Thursday. He joins fellow Blues and Thunder batsman Jason Sangha in the Cricket Australia XI squad for that match. Bartier posted his second century of the campaign against Wests. He peeled off eight boundaries and five sixes during his 133 from as many balls. The triple century stand also set a new second wicket record for St George across all formats. It replaced the previous best set by the great Australian Test batsman Norm O’Neill and fellow Test player Billy Watson, who recently passed away aged 87. O’Neill and Watson made 264 for the second wicket against North Sydney in 1963/64. The huge partnership by Patterson and Bartier established a score of 5/349. In reply, Western Suburbs was bowled out for 194. Bartier added to his century with the tidy figures of 2-13 from four overs. Opening bowler Thomas Ortiz (3-34) was best of the St George attack. St George captain and Blues seamer Trent Copeland also claimed 2-36 from his 10 overs. Remarkably, two of the top five highest ever scores in the history of the First Grade Limited-Overs Cup were posted on Saturday. The 349 made by St George is the fourth highest, while UTS North Sydney registered the fifth best posting 4/348 that provided the platform for a 49-run win over Parramatta. Parramatta was dismissed by Norths for 299 at North Sydney Oval. North Sydney captain Thomas Jagot (130) was part of two century stands during the huge first innings total. Both partnerships were shared with the Crosthwaite brothers. Jagot and James Crosthwaite (90) compiled 179 during their opening partnership, followed by 129 for the second wicket with Adam Crosthwaite, who made 104 from a mere 58 balls. Crosthwaite reached the boundary 10 times during the blistering hundred and cleared it seven times. The century was the fifth of the season for Crosthwaite and the 20th of his First Grade career. Crosthwaite went to 879 runs for the season, at an average of 73.25, courtesy of the century. He also passed 7,500 First Grade career runs and now has 7,575 to his name at 45.53. Jagot posted his second century of the NSW Premier Cricket campaign during his 142 deliveries at the crease and the innings took him past 2,000 career runs in First Grade. He now has 2,078 at 37.1. James Aitken (3-38) claimed best figures in the win for North Sydney. 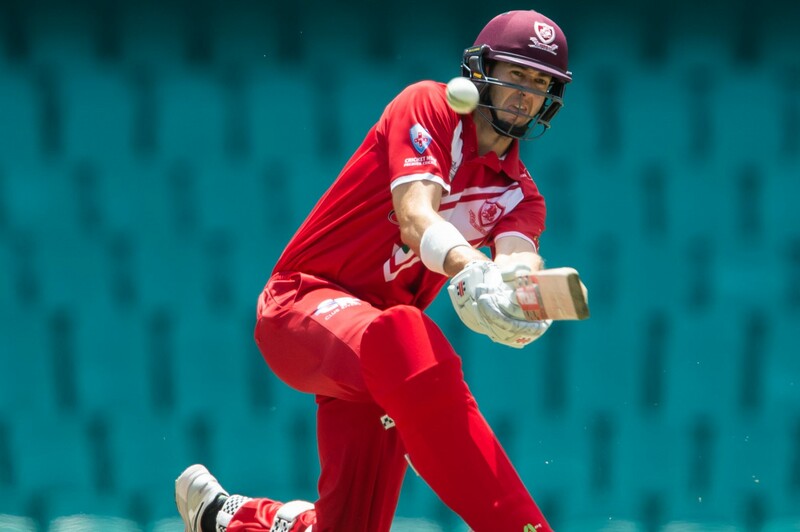 Given the limited-overs round also coincided with round nine of the McDonald’s NSW Premier Cricket competition, the win moved North Sydney into the top six. Norths wicketkeeper James Crosthwaite also claimed four catches behind the stumps. Blacktown captain and Blues rookie Jordan Gauci continued his fantastic record in the 2018/19 First Grade Limited-Overs Cup. Gauci peeled off 103 from 126 balls to post his third consecutive century in the competition during an amazing tie with UNSW. He has now 323 runs for Blacktown in One-Day cricket this season at an average of 161.5. The Bumblebees set Blacktown 252 for victory after they made 9/251 at Village Green. In reply, Blacktown was dismissed for 251 on the last ball of the 50 overs. Gauci kept his side in the match with his century. The next best score for the visiting side was Antum Naqvi (36). Naqvi completed a solid all-round performance for Blacktown during the tie. He claimed 3-42, took two catches and assisted a run out. English First Class seamer Christopher Wright claimed the only five-wicket haul across the 10 matches on Saturday. He collected 5-39 from nine overs for Northern District during its five-wicket win over Sutherland at Glenn McGrath Oval. It was his first five-wicket haul for Northern District in the top grade. Wright has played 146 First Class matches and taken 406 wickets at 33.51. Northern District captain Ben Davis made an unbeaten 121 in the successful chase. He and Nic Badings (45) added 100 runs for the third wicket after the visitors fell to 2/8. Sutherland made 236 batting first with captain Chris Williams (94) top-scoring for the hosts. In the process, Williams recorded his seventh half-century of the season. He shared a 107-run fifth wicket stand with NSW Metro Under 19 wicketkeeper-batsman Aiden Bariol (41). In reply, Northern District finished 5/237. Sydney top-order batsman Anthony Mosca (119) made his second consecutive century in NSW Premier Cricket and, the seventh of his career, in a three-wicket win over Penrith to keep the Tigers on top of the Limited-Overs Cup table. Mosca hit eight fours and three sixes during his century that proved crucial to the win sealed with 10 balls to spare. It followed 104 scored by the No. 3 against Gordon during the last round before Christmas. Sydney finished at 7/305 at Drummoyne Oval in response to the Penrith total of 6/304. Cameron Weir was the star batsman for the Panthers. He made 113 from 119 balls and combined with Brent Williams (67) to add 123 for the fourth wicket. Hawkesbury opening batsman Josh Clarke (117 not out) matched his highest score of the season and shared another huge partnership of 194 with Dale McKay (96) in the Hawks win over Manly-Warringah. The stand all but sealed the eight-wicket victory at Manly Oval. Clarke previously made 117 against Northern District in round five of the McDonald’s NSW Premier Cricket competition. Like McKay, Manly captain Cameron Merchant fell agonisingly short of a century. He top-scored for the hosts with 93 from 97 balls. Manly made 5/232 from its 50 overs after it won the toss and elected to bat. Opening bowler Chris Lawrence (3-46) claimed best figures for the victors. In reply, Hawkesbury cruised to victory with eight overs to spare and finished 2/233. A superb all-round performance by Mosman captain Scott Rodgie helped the Whales to their second win of the Limited-Overs Cup. He made 101 and claimed 3-35 in the 47-run win over Fairfield-Liverpool at Allan Border Oval. Rodgie added 190 in partnership with Patrick Pisel (81) for the third wicket in a total of 8/269. Blues paceman, Liam Hatcher (4-46) and allrounder Param Uppal (3-43), claimed best figures for Fairfield-Liverpool. In response, Fairfield-Liverpool was bowled out for 222 within 46 overs. Former Australian Test opening batsman Ed Cowan made his third half-century in five visits to the crease this season and top-scored for Sydney University during its five-wicket win over Bankstown. Cowan made 85 from just 63 balls including nine fours and four sixes. Together with Damien Mortimer, he added 108 for the third wicket in a total of 5/235. Bankstown was bowled out for 231, at Bankstown Oval, after it won the toss and batted first. Thunder paceman Nathan McAndrew made a quick fire 78 from 82 balls and top-scored for the hosts. Sydney University captain Liam Robertson (3-30) and leg-spinner Devlin Malone (3-33) both claimed three wickets a piece in the win. Cowan took his career tally past 7,500 runs courtesy of the blazing knock on Saturday. He has scored 7,555 First Grade runs at 42.2 including 13 centuries. A 156-run second wicket partnership between Gordon captain Harry Evans (85) and Steve Colley (81) set up a convincing 59-run victory over Eastern Suburbs for the away side at Waverley Oval. Gordon restricted Easts to 9/203 as they chased 263 for the win. The Stags made 9/262 from their 50 overs. Max Newman was again outstanding behind the stumps for Gordon with four catches and a run out assist. The catches took his season tally for the campaign to 24 dismissals. Blues quick Harry Conway was good with the ball and bat for the Dolphins. He claimed 2-28 from his overs but also made 43 not out from 39 balls at No. 10. In the other match, during round three of the First Grade Limited-Overs Cup, Campbelltown-Camden defeated Randwick Petersham by four wickets in a match reduced to 28 overs per side by the weather. The Ghosts made 4/166 in reply to 6/163. Luke Courtney claimed best figures for Campbelltown-Camden with 3-32. UNSW 9-251 (T Islam 74 H Brook 50 D Dawson 44 J Byrnes 31 A Naqvi 3-42 A Kherkhah 2-30 S Irshad 2-65) tied Blacktown 251 (J Gauci 103 A Naqvi 36 S Irshad 21 J Bennett 3-48 M Atallah 2-37 D White 2-47 H McLean 2-58) at Village Green. Sydney University 39 Sydney 38 UNSW 35 Parramatta 31 Penrith 31 UTS North Sydney 31 Randwick Petersham 30 Sutherland 28 Northern District 26 Campbelltown-Camden 26 Bankstown 25 Blacktown 21 St George 20 Gordon 20 Hawkesbury 20 Eastern Suburbs 20 Mosman 19 Manly-Warringah 19 Western Suburbs 18 Fairfield-Liverpool 16. Sydney 20 Sydney University 19 UNSW 15 St George 13 Gordon 12 Northern District 12 Bankstown 12 Campbelltown-Camden 12 UTS North Sydney 12 Mosman 12 Hawkesbury 12 Penrith 7 Parramatta 6 Sutherland 6 Randwick Petersham 6 Manly-Warringah 6 Blacktown 3 Eastern Suburbs 0 Fairfield-Liverpool 0 Western Suburbs 0.